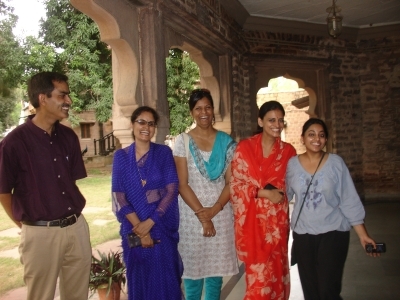 The Kota Heritage Society exists to enable friends of Kota's heritage to share the responsibility for its upkeep and preservation. Our society is based in Kota, Rajasthan, India. Please browse our website and get to know us better. You can get information about the projects we are involved in here. Members can catch up on the news and upcoming events, view audited accounts, leave comments, download documents and send queries to the Society Office. 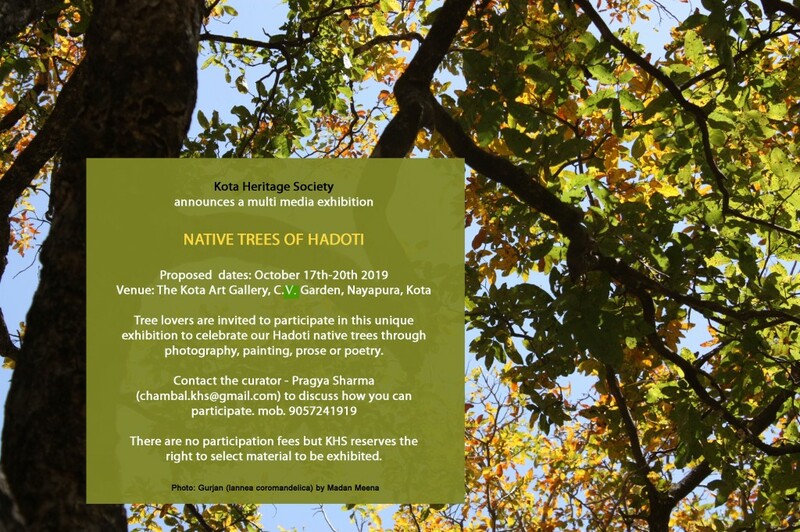 This exhibition to be held from 17th - 21st October, 2019 at the Kota Art Gallery will celebrate our native trees in photographs, art, textiles and other media. Please contact Pragya Sharma if you would like to be involved. 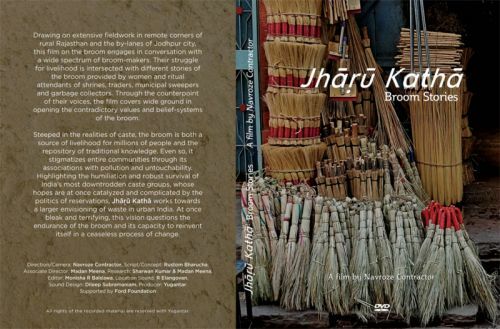 Pradip Krishen, author of excellent books 'Jungle Trees of Central India' and 'Trees of Delhi' will be opening the exhibition on 17th October, 2019. 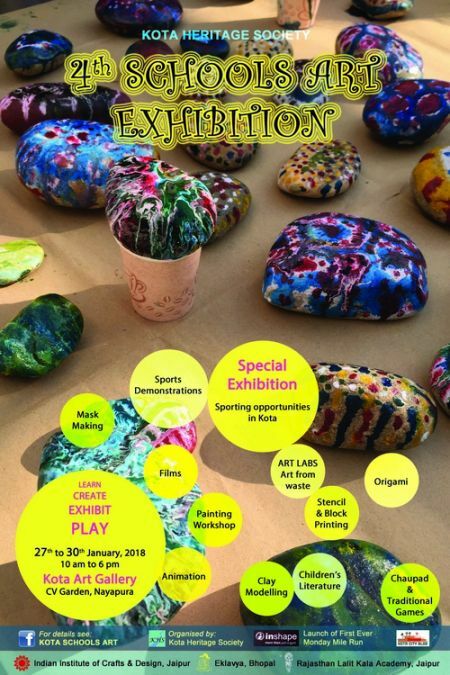 The exhibition was held from 28th - 31st January, 2019. 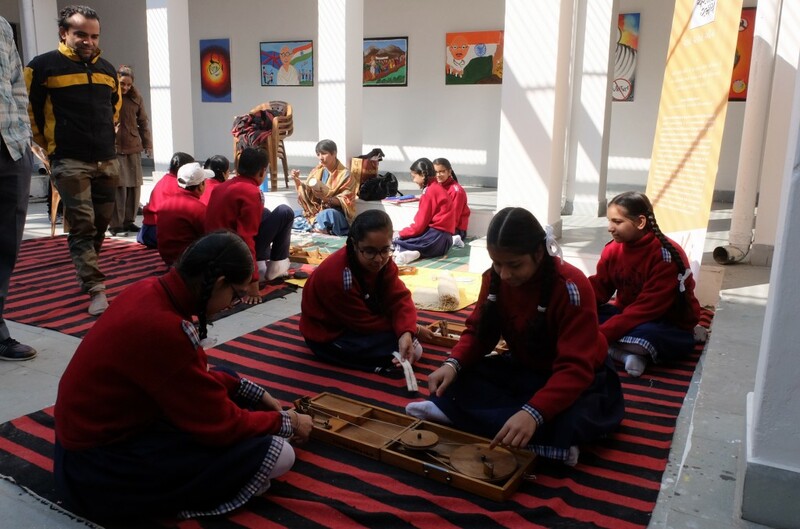 Highlights were Avni Varia from Ahmedabad teaching spinning on a box charka, workshops by Sachetan and the Indian Institute of Craft and Design Jaipur, book stall and craft workshops by Ektara of Bhopal, pottery and canvas painting. 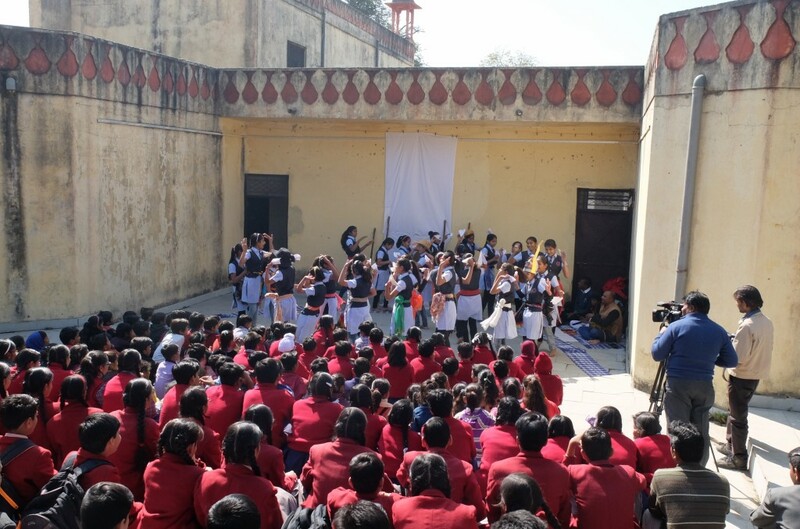 Bhuvnesh Bal Vidyalaya performed a new drama based on the life of Gandhi and several schools participated in a public speaking event 'Gandhi and Me'. We are grateful to all those who volunteered to help. 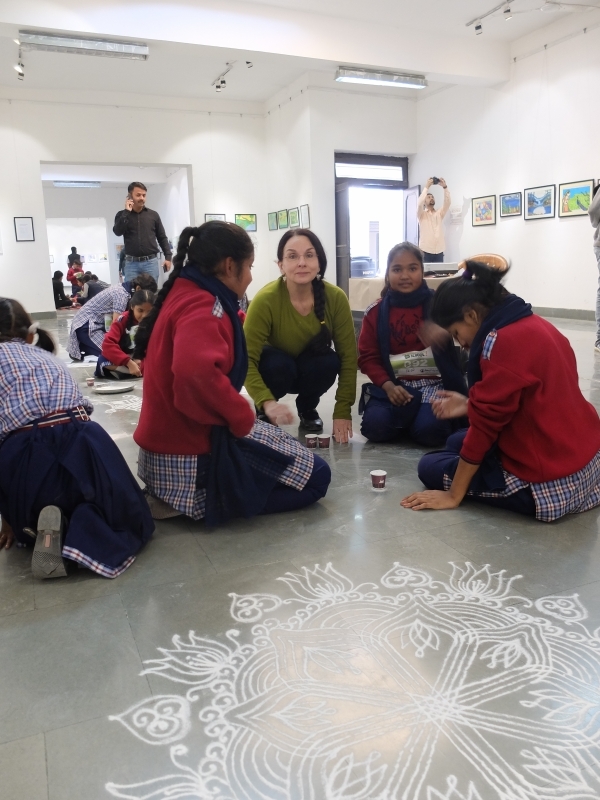 Eleven schools exhibited five selected paintings each on the Gandhian theme of truth, non-violence, compassion and freedom; these paintings have been framed and returned to the respective schools to display. 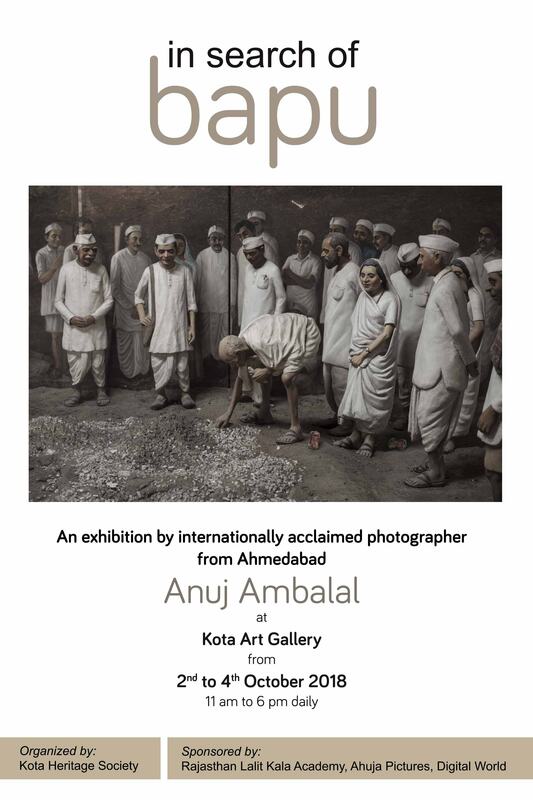 KHS is proud to be associated with this exhibition which runs at the Satya Art Gallery, Ahmedabad from 26th October to 2nd December 2018. 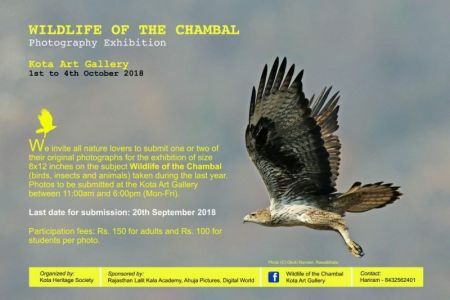 This year’s beautiful image is of a Bonelli’s Eagle photographed by Devki Nandan of Rawatbhata. 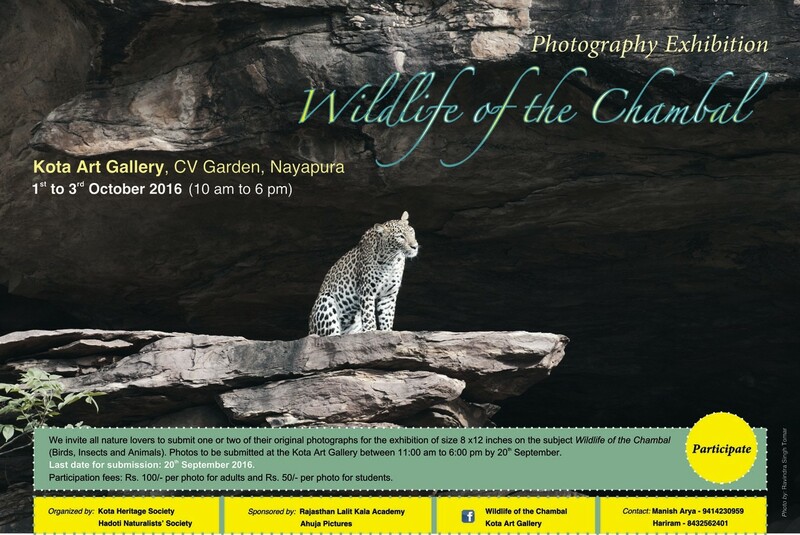 Any nature lover can submit two photos for the exhibition and can download the form and term and conditions here. Photos need to be submitted by September 20th at the latest. Once again we were able to show a superb variety of Hadoti's wildlife. 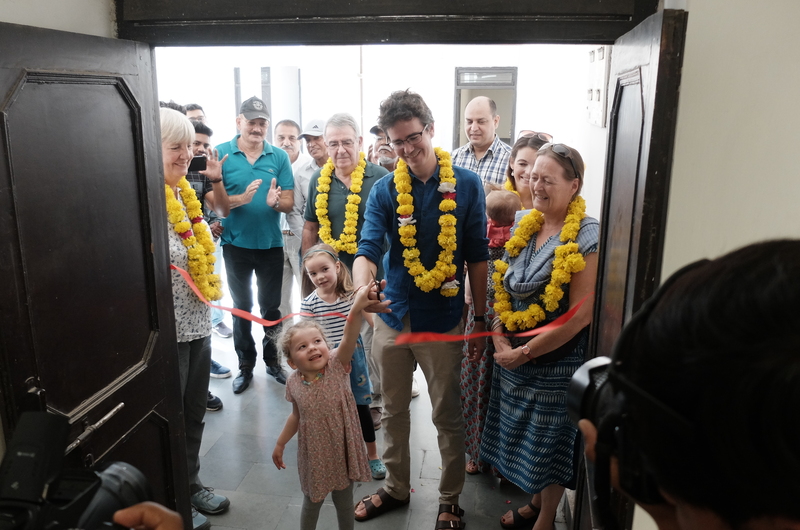 The exhibition was opened by Kieran Drake, Minister Councillor Political and Press at the British High Commission in Delhi, assisted by Hadley his three-year old daughter. Groups of children came to paint in response to the photographs. 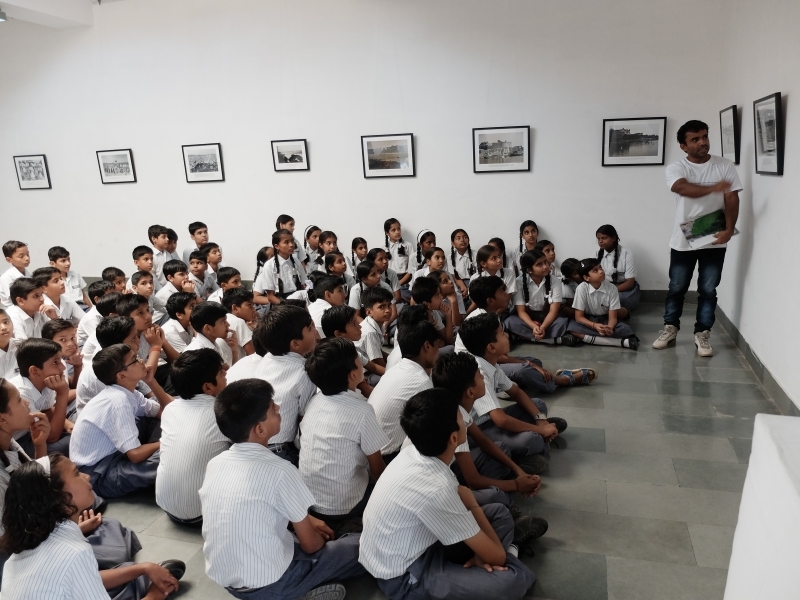 Anuj Ambalal and Navroze Contractor were with us all week and Anuj was able to talk to more than 800 young people about his enigmatic exhibition. He was also invited to do a school presentation and stayed on for an extra day. 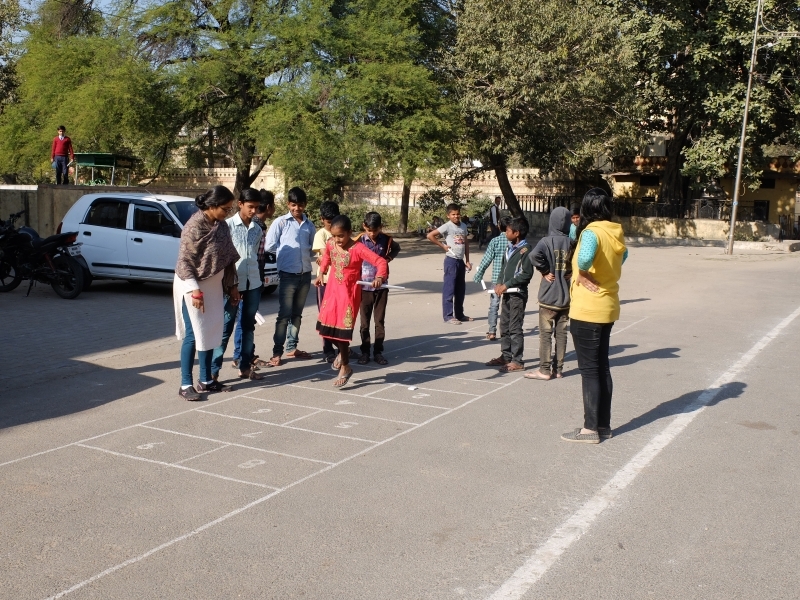 The students ranged from trainee teachers to school students to shelter home children and after school groups; all showed an interest and enthusiasm for decoding the photographs. 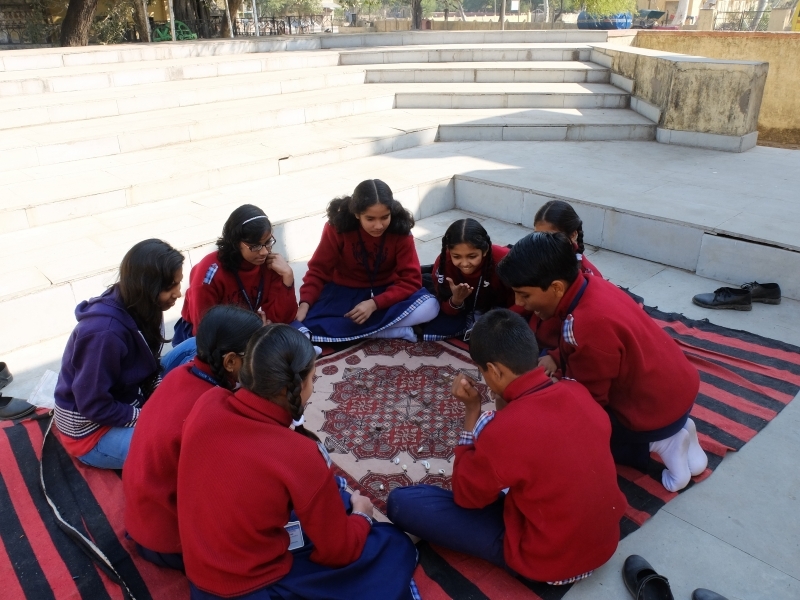 We had prepared a multiple choice quiz in Hindi and English for the groups which they were invited to take home and discuss with their parents. The exhibition was opened by local Gandhian Naresh Vijayvergia, assisted by local historians. 2nd October is celebrated as Gandhi Jayanti (Gandhiji's birthday) and the schools are expected to do Gandhi related activities. 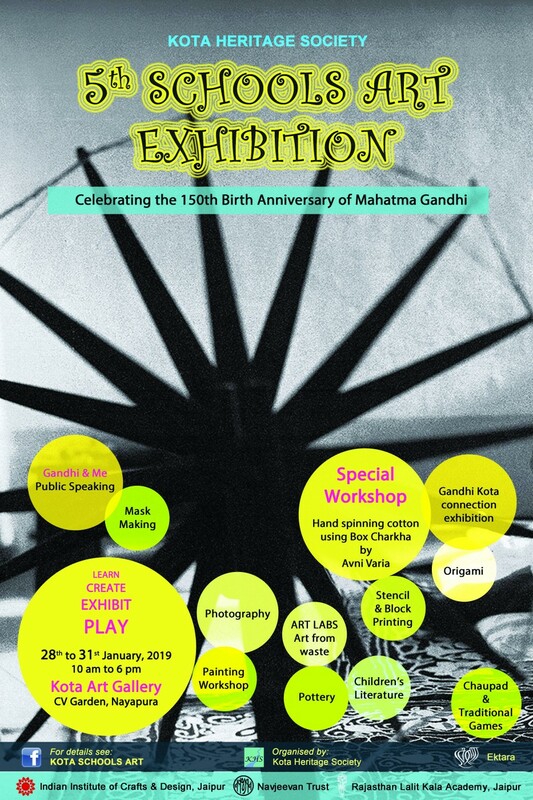 This is the beginning of the 150th anniversary year and so Gandhi events are being organised held across India throughout the year. 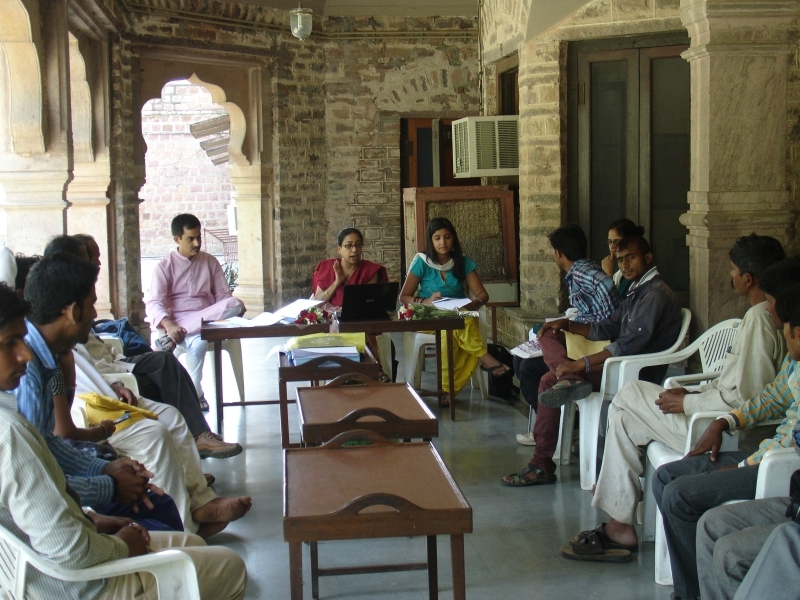 Anuj also gave a presentation at Sukhdham Kothi on Tuesday, 2nd October - Gandhi Jayanti. 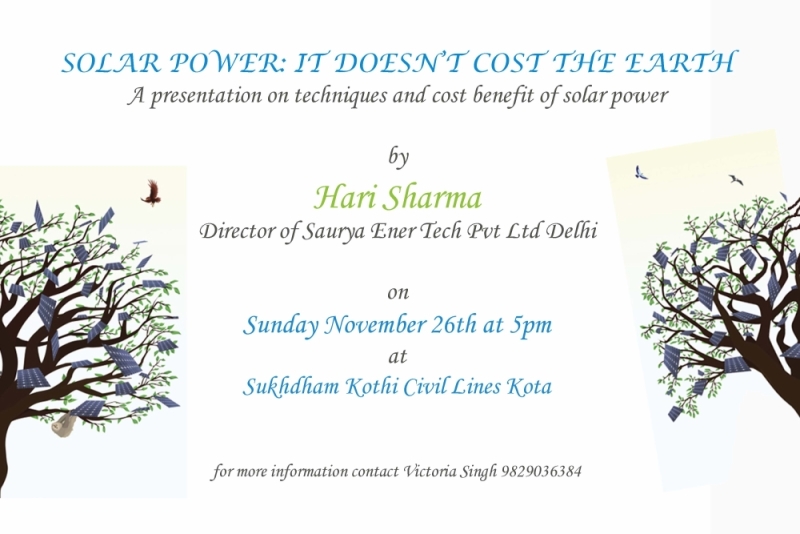 On Sunday, 26th November 2017, Hari Sharma, KHS member and Director of Saurya Ener Tech Pvt. 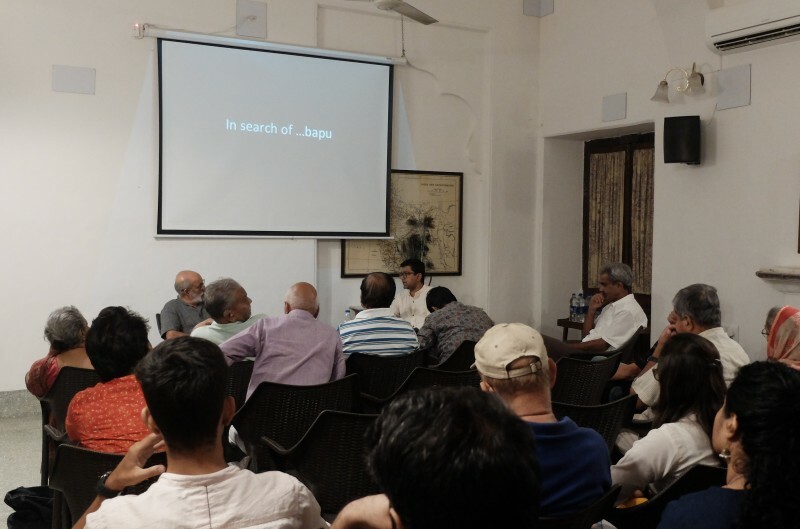 Ltd., Delhi gave a stimulating talk which generated a lot of interesting discussion between Hari and the audience. In the photograph below, Hari, in the centre, is continuing the lively session with his engineering friends over refreshments. The price of solar has come down dramatically. In particular, net metering is cost effective even for the householder. 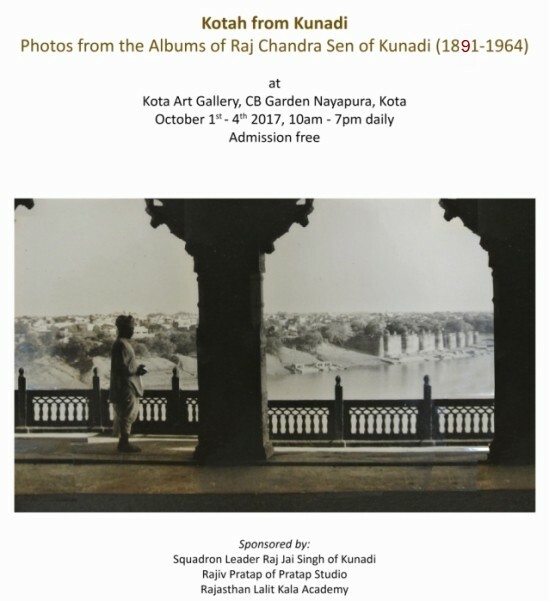 Raj Chandra Sen of Kunadi's photographs of the River Chambal dating back to historic floods in 1916 were widely appreciated. 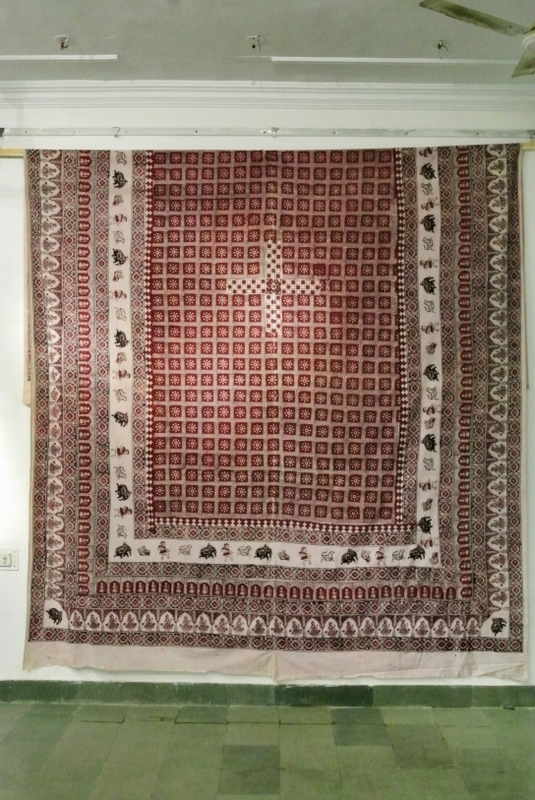 The exhibition is now on loan to the Kunadi Family. His Highness Maharao Bhim Singh visited the exhibition and remembered being taken to see the RAF seaplane that landed on the River Chambal near the Garh for repairs in 1937 when he was only three. Hundreds of school children also visited. 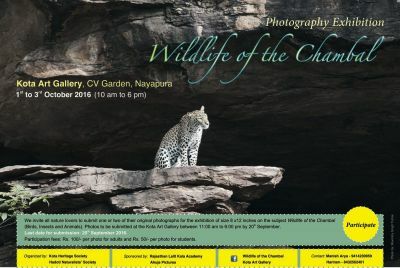 This exhibition was organised in association with the Hadoti Naturalists' Society. 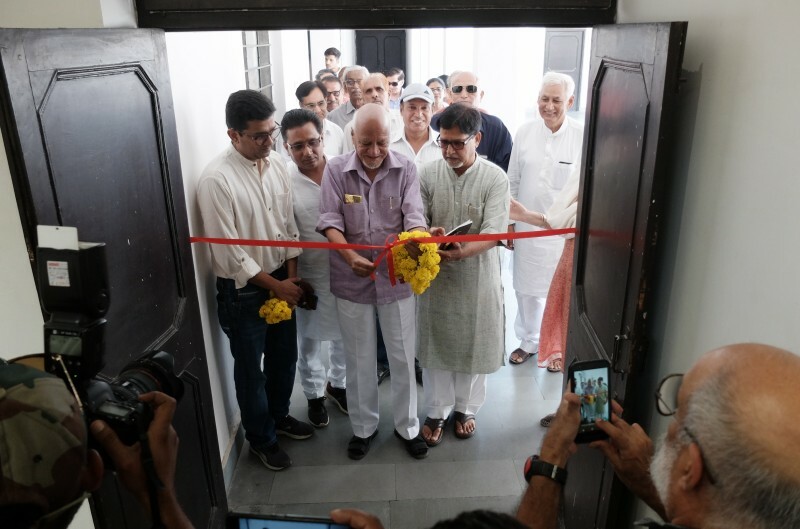 It was inaugurated by the Collector of Kota, Shri Rohit Gupta on his first visit to the Kota Art Gallery. Over 50 local photographers had submitted photographs. Dr. K.S. Gopi Sundar, Director of the sarus crane programme for the International Crane Foundation took a fascinating seminar at the Umed Club in the afternoon. Other events included the screening of the film 'Broken Tail' which is about a young male tiger that disappeared from Ranthambore Wildlife Sanctuary in 2003 and turned up in the Dara Sanctuary near Kota where it died tragically 3 months later when hit by a train. This sanctuary is now the Mukundra Hills Tiger Reserve and the first tiger is due to be introduced here in December 2017. With such a varied collection of themes we were able to attract a lot of new people to the Art Gallery who had never been there before. International photographer Navroze Contractor exhibited his black and white photographs exploring the traditional sport of kushti or wrestling. Sarvesh Hada managed to capture the spirit of the akhadas (wrestling clubs) of Kota in his photographs. We invited all the Kota ustaads and honoured them in the traditional way by presenting saafas (turbans). 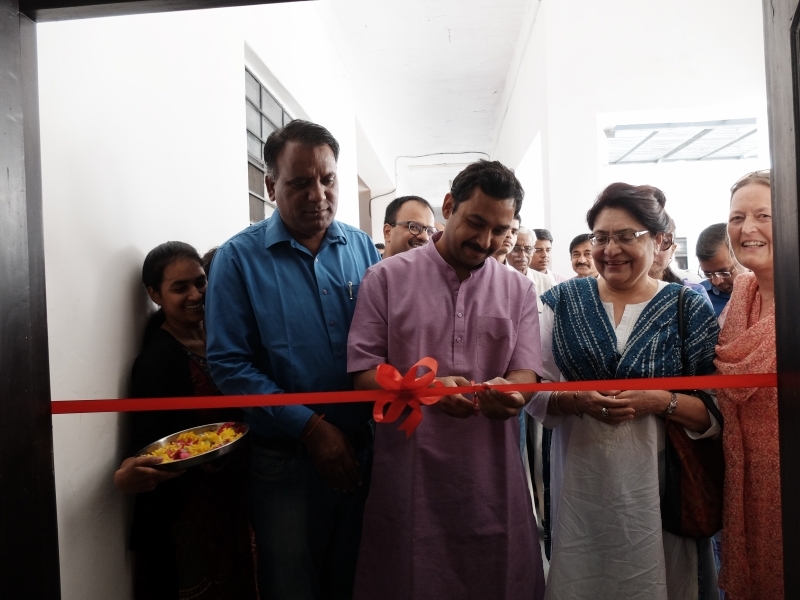 This was the first time that their contribution to kushti had been recognised by the general public and there was a terrific buzz of excitement at the opening. Click on any thumbnail above to view full size photographs in a new window. 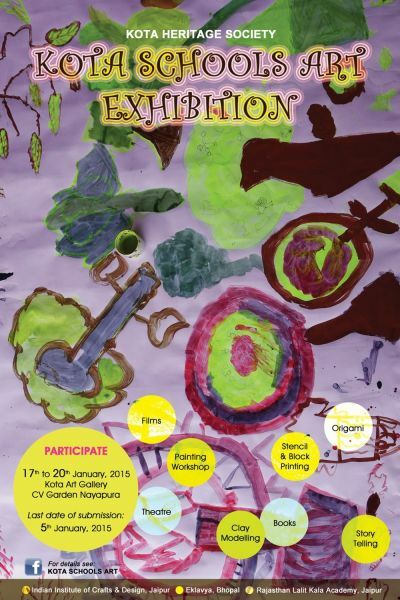 This third Schools Art Exhibition was for out-of-school children and special groups. British artist Elizabeth Simson ran a workshop in which ten groups painted canvases - using acrylic paint - to be hung in the Government Hospital as part of our Hospital Art Project. 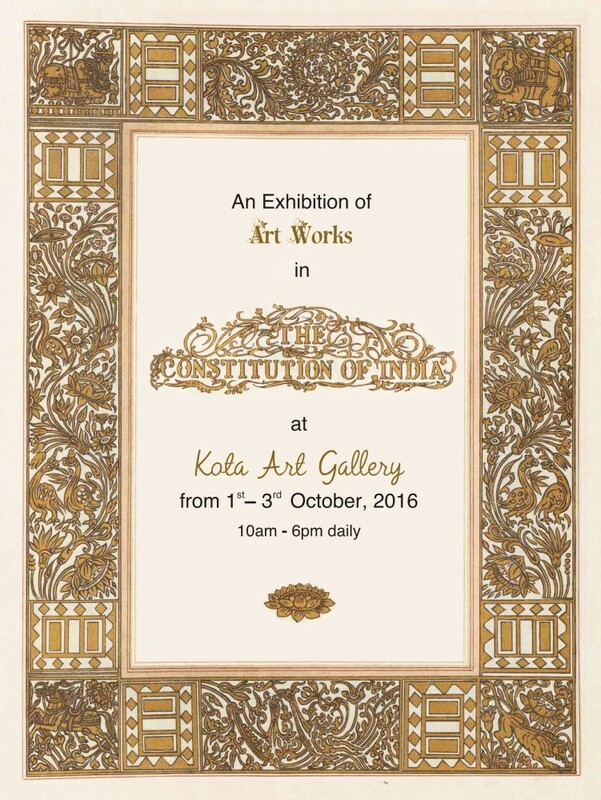 The exhibition ran from 1st - 3rd October, 2016, 10am to 6pm daily. 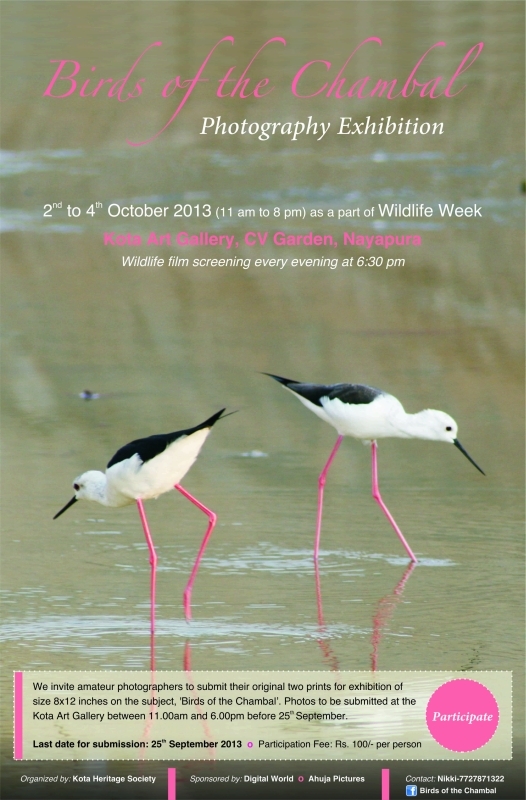 This year's successful photographic exhibition was run jointly with Hadoti Naturalists Society. 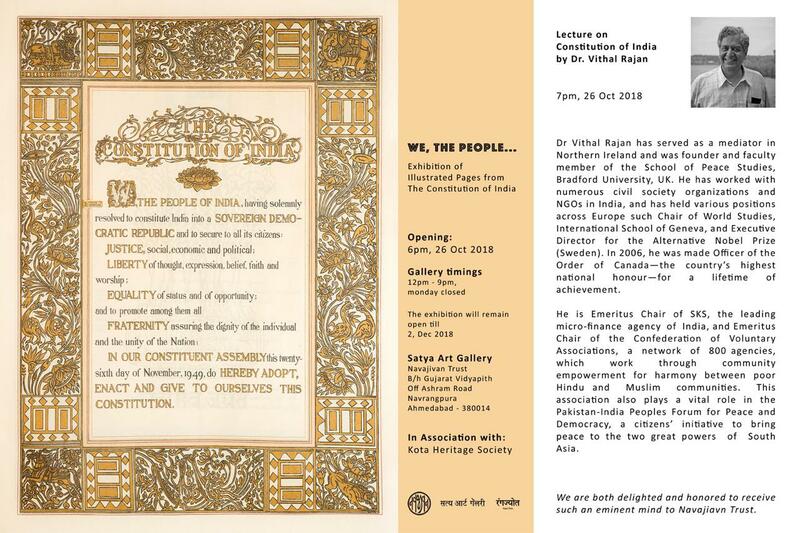 At the same time we ran a fascinating exhibition about the art works in the Constitution of India, which is available for hire elsewhere. Venue: Kota Art Gallery, CV Gardens, Nayapura, Kota. 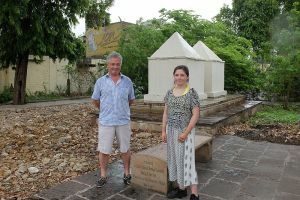 On 2nd July, 2016, Frank Hancock came to Kota and introduced his eldest daughter, Eliza, to the spiritual haunt of her ancestor the 21 year-old Lt. Charles Hancock who died on 14th April, 1858 of wounds received at the retaking of Kotah from the rebels. Frank is the sixth generation of Hancocks to live and work in India. 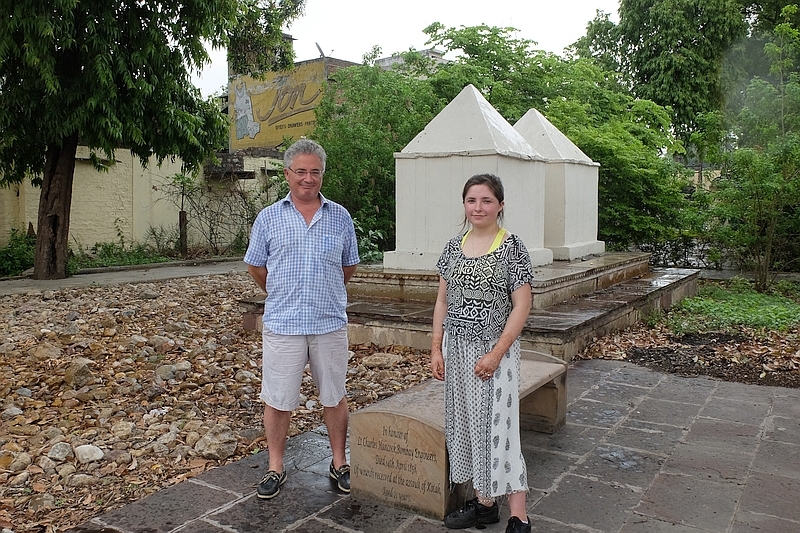 Eliza had come with a friend from her home in Ireland to backpack around Rajasthan and we hope her visit marks the beginning of a lifelong association with Kota. Our youngest member Palash, Madan and Rekha's son, came to the AGM held on 17th April, 2016. Palash was born on 26th February, 2016. Palash is the tree Flame of the Forest, and he is wearing an outfit in exactly the right colour. The palash blooms are at their best in February-March. 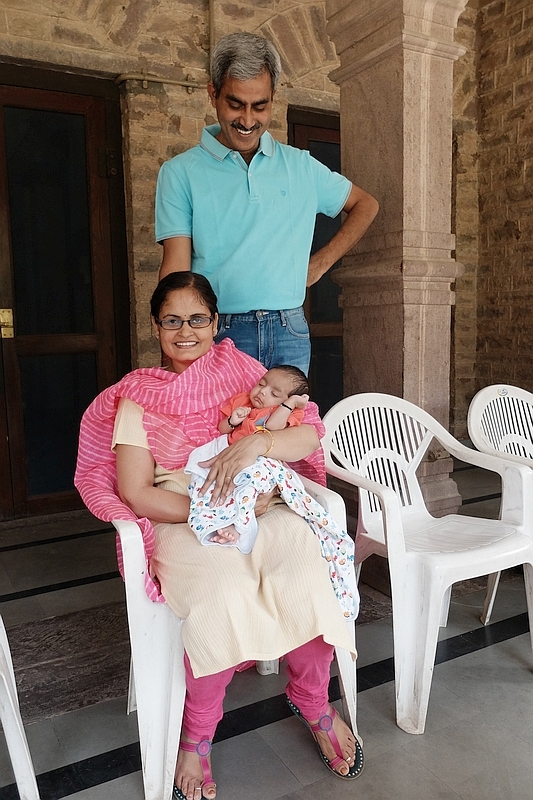 Our congratulations to Madan and Rekha on the birth of their first child. 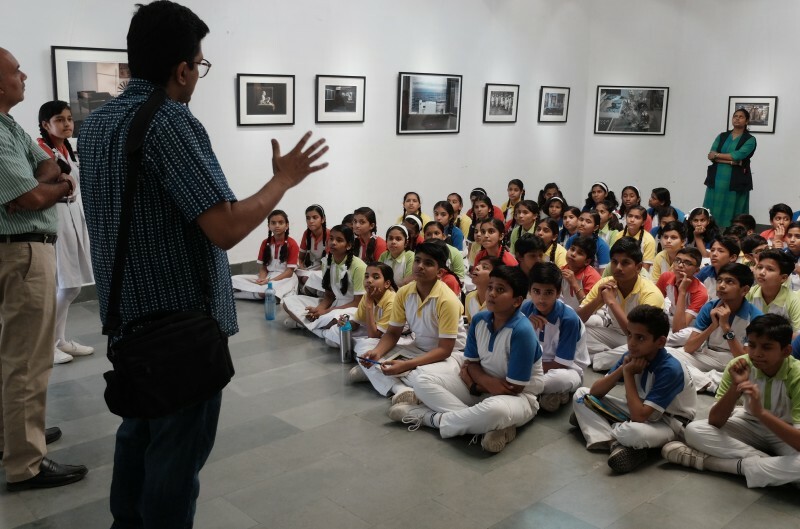 Groups of school students from eleven different schools and NGO's and numerous individuals came to the Kota Art Gallery between 23rd January and 25th January. 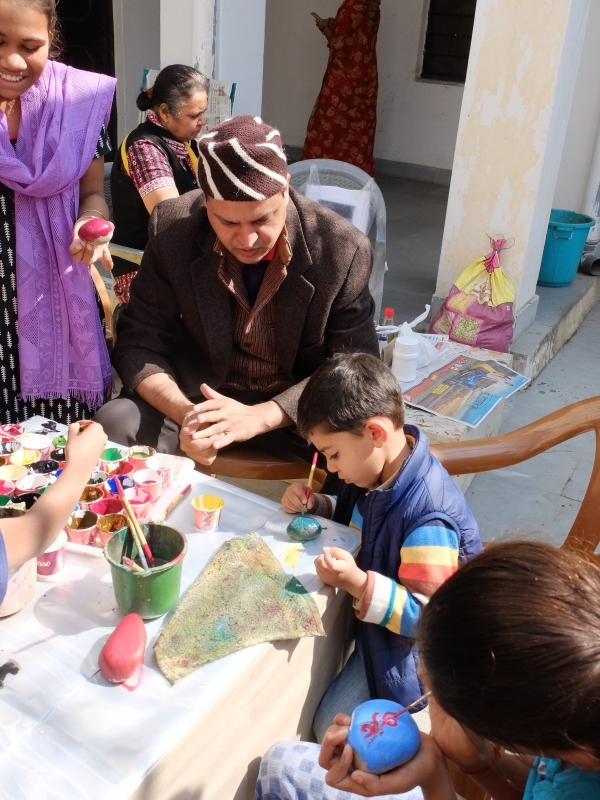 They could choose to have a go at pottery, pebble painting, mask making with plaster of paris bandages, panel painting, block printing, jewellery making with seeds, origami, Russian guardian angel cloth doll making and Artlabs run by NGO Sachetan. Artlabs opened the eyes of everyone to the possibility of creating something beautiful from plastic waste. There was a bookstall by Eklavya from Bhopal and drama by student groups. This year all activities were free and the KHS members and other workshop leaders gave generously of their time for three days. The students created the art work to be exhibited on the final day. 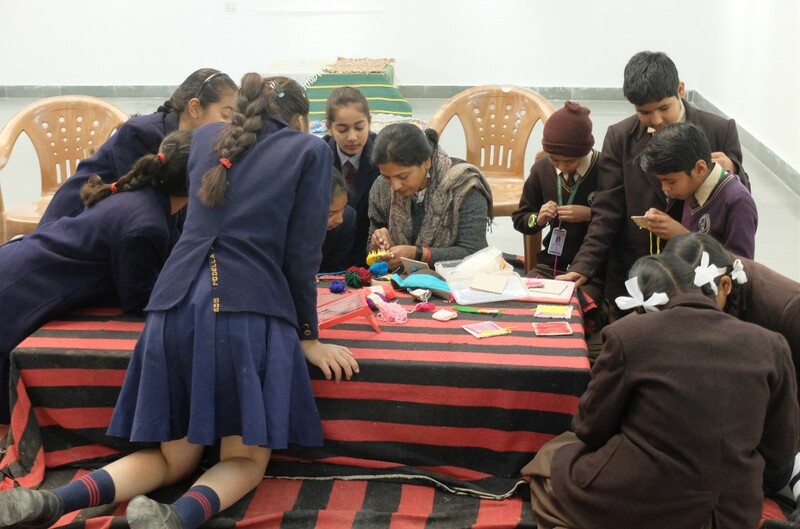 The Indian Institute of Craft and Design in Jaipur provided staff and students for some of the activities. 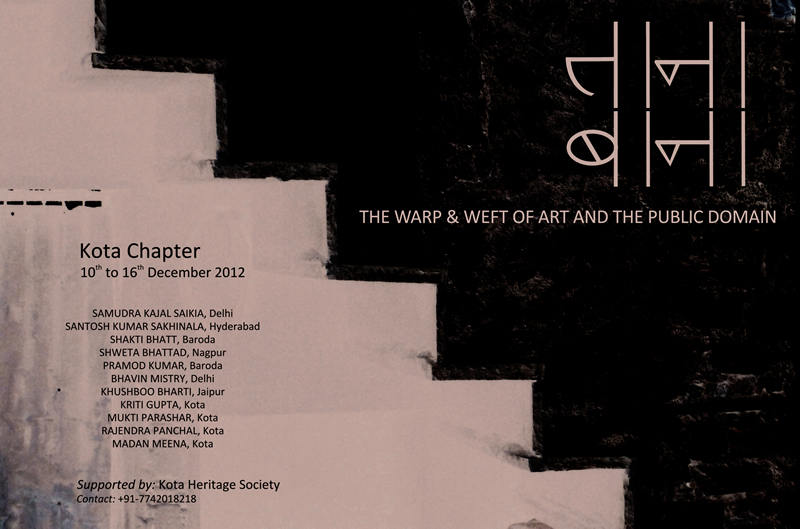 The use of the gallery was sponsored by Rajasthan Lalit Kala Akademi and Ahuja Pictures kindly lent the display boards. The panels created during the exhibition have been donated to the local children's hospital (see latest news). 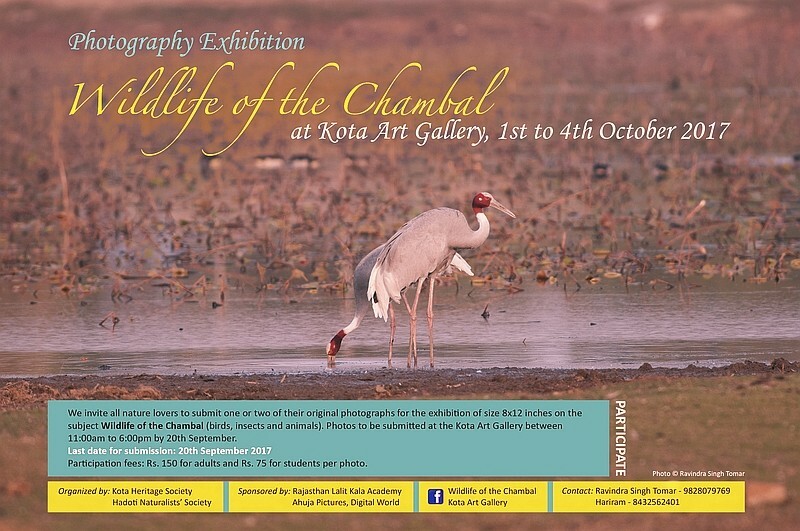 For a variety of photographs of the exhibition see the facebook pages Kota Art Gallery and Kota Schools Art Exhibition. 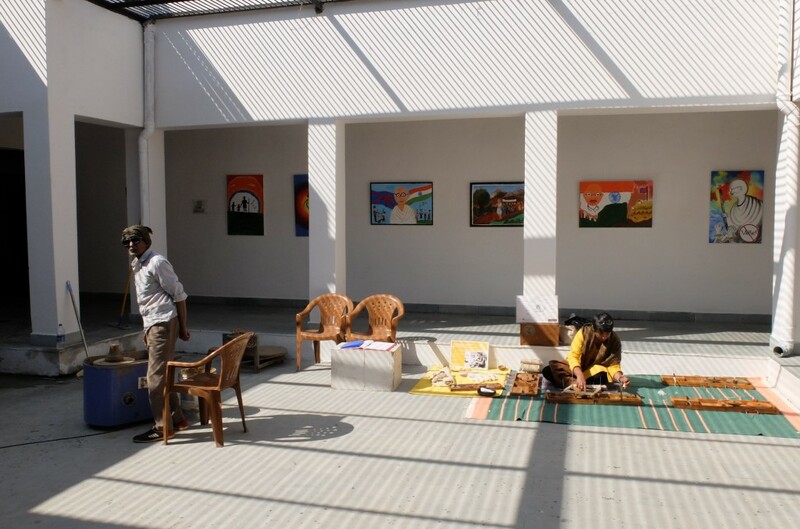 A major purpose of the art exhibition was to reinforce the belief that school aged students should be in schools catering to their all round development. Our Chief Guest at the closing ceremony Rear Admiral (Retd.) 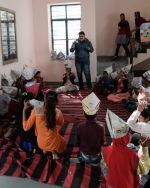 Vineet Bakshi, VSM, a trustee of Bakshi Schools reiterated the importance of holistic education and a wide choice of careers. 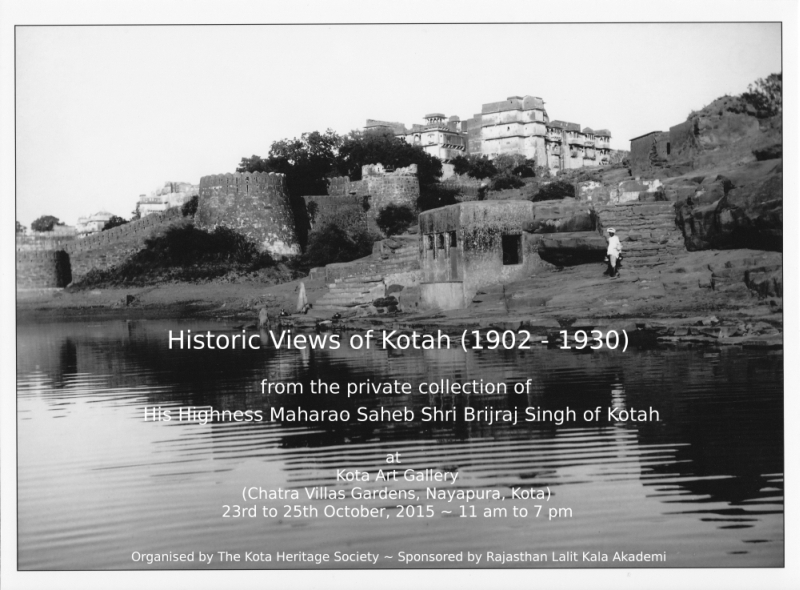 This was a very special exhibition of photographs from the private collection of HH Maharao Saheb Shri Brijraj Singh of Kotah. From the panoramic views of the City Palace, fortifications and the Chambal to the everday street and river scenes, the exhibition will enthral the visitor with a visual journey from 1902 to 1930 during the reign of Maharao Umed Singh II of Kotah (1889 - 1940). 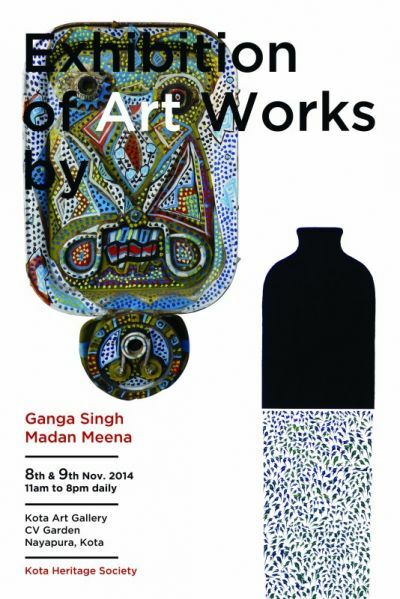 The exhibition ran from 23rd - 25th October, 2015, 11 am to 7 pm daily. Her Highness Maharani Saheba Shirmati Uttara Devi of Kotah kindly inaugurated the exhibition. The exhibition ran from 23rd - 25th October, 2015, 11 am to 7 pm daily. A record number of photographers submitted original photographs of birds and/or insects for display at the exhibition. 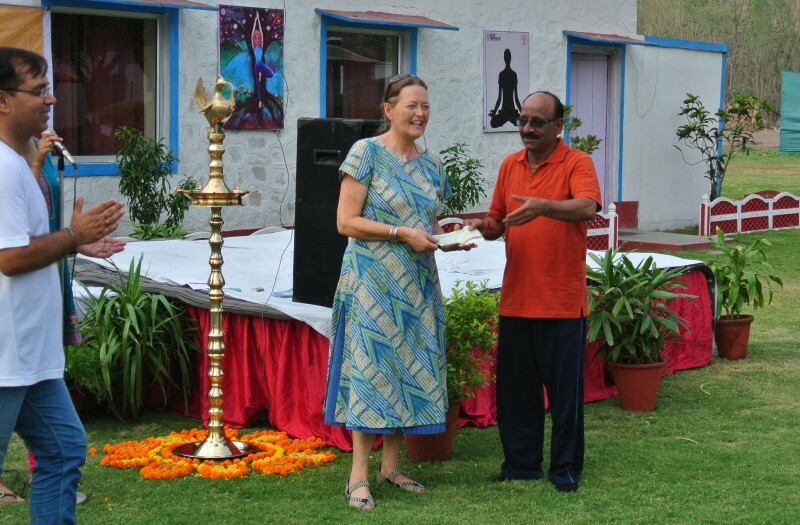 1st International Yoga Day was observed throughout the world on Sunday, 21st June 2015 and I was called to Shriram Rayons at 6.15 am to receive a cheque for one lakh rupees for Madan's work on recording, transcribing and publishing Hadoti's rich traditions of oral literature. We are currently working on "Mataji ki Jas" in praise of Durga (although different versions of Tejaji are also being recorded). Some of the money will be utilised to buy field recording equipment. 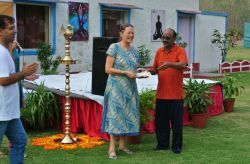 One could claim that the link between yoga and oral literature is that they are both part of India's intangible heritage. We hope that Shriram will continue to support this aspect of our work. The cheque was presented by Vice-President Mr. V.K. Jaitly. 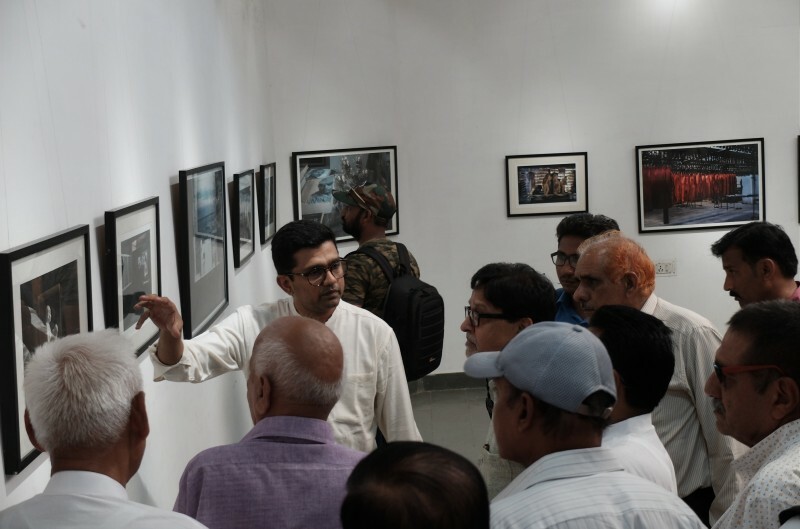 The Secretary of Lalit Kala Akademi, which owns the Kota Art Gallery, drove down from Jaipur on 19th June, 2015 expressly to visit the Gallery and to assess its situation. Sovali Mathur, dressed fortuitously in a lotus pink sari, is standing in the amphitheatre in front of the Lotus Pond. She showed great interest and we are hopeful of some funding and improvements. KHS has taken the lead in looking after the Gallery and promoting it. There is a Facebook page devoted to "Kota Art Gallery" which aims to spread awareness of activities in the Gallery. 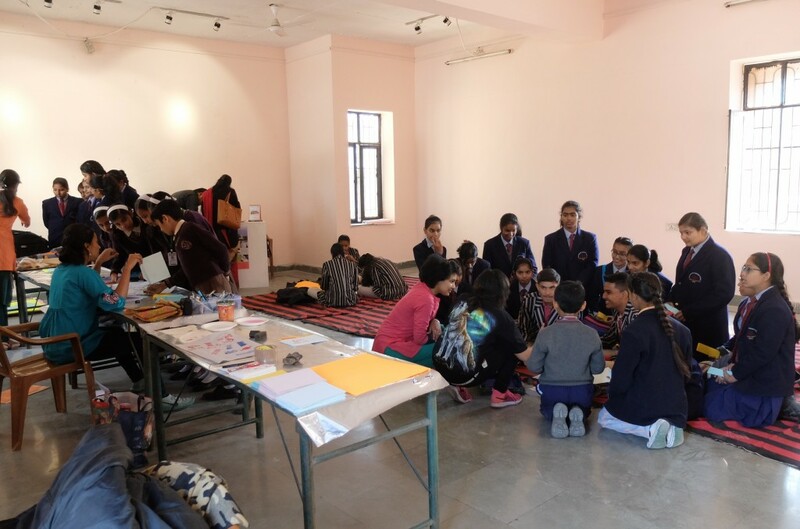 Our last event of the winter was a painting workshop for school students sponsored by Saarthi Credit Co-operative Society Ltd. on 22nd March, 2015 at the Kota Art Gallery. We now have seven colourful canvases to hang in the government hospitals to cheer-up the patients. These four Class 11 girls travelled for two hours by bus to participate. Their art teacher brought 12 students on a Sunday. Art is the only subject available as a specialisation in their government secondary school. Their fathers are mainly agricultural labourers and small holders whose crops have been ruined in the recent hail storm. 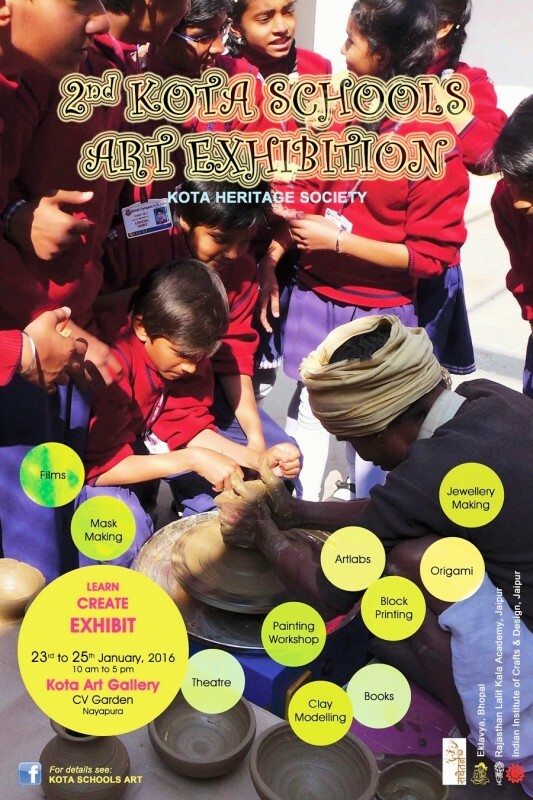 The highly successful, first-ever, "Kota Schools Art Exhibition" was organised under the auspices of Kota Heritage Society, in association with the Indian Institute of Crafts and Design, Jaipur, at the Kota Art Gallery from 17th to 20th January, 2015. 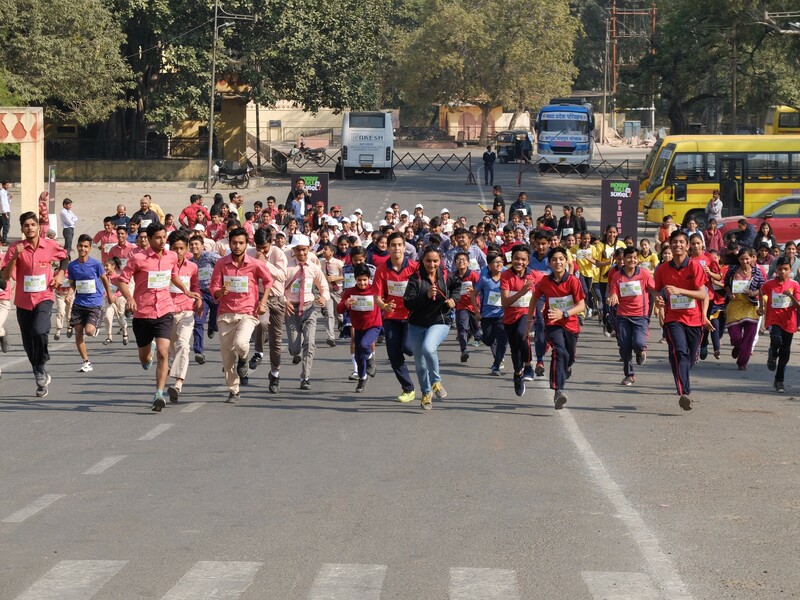 You can find lots more information and feel the energy of the event at Kota Schools Art on Facebook. The exhibition attracted many visitors and was declared a success. 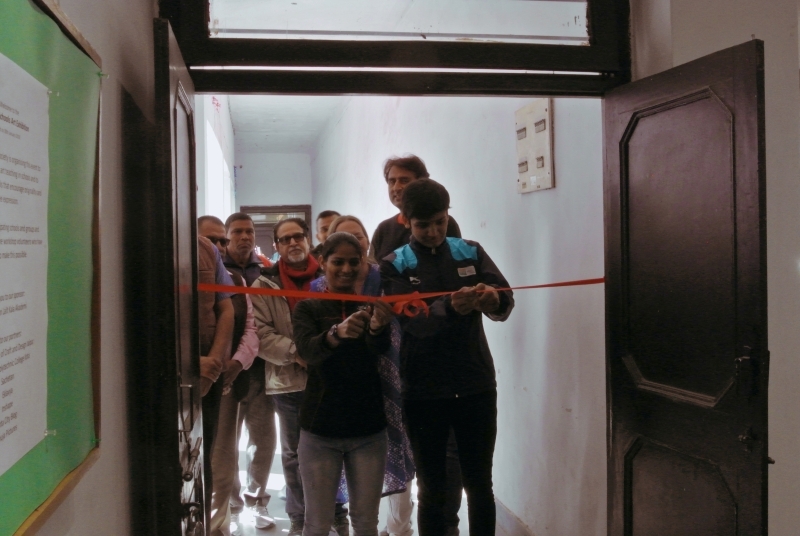 In addition, on the sidelines there was a talk by Ashok and Deepika Hazra on their paintings in the evening of the 8th which saw many admirers and former students turn up for an engrossing talk and slide show. On the 9th Rakesh Vyas signed a limited number of his book "Birds of Rajasthan;" this was followed by a very interesting and thought provoking talk on the reasons why the vulture population had declined. 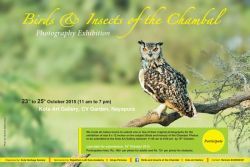 Following the success of last year's photographic exhibition "Birds of the Chambal," the year 2014 saw a shift in focus to local insects as well by calling this year's exhibition "Birds and Insects of the Chambal." 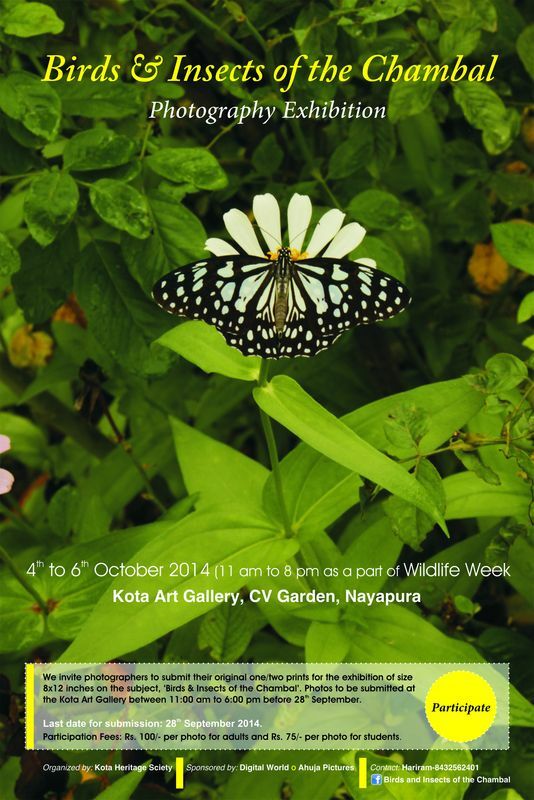 The exhibition was held in the Kota Art Gallery from 4th October to 6th October to celebrate Wildlife Week. Everyone was invited to participate and we mounted and framed a maximum of two suitable photographs submitted in a 8" x 12" format by each entrant. There were about 50 entrants. 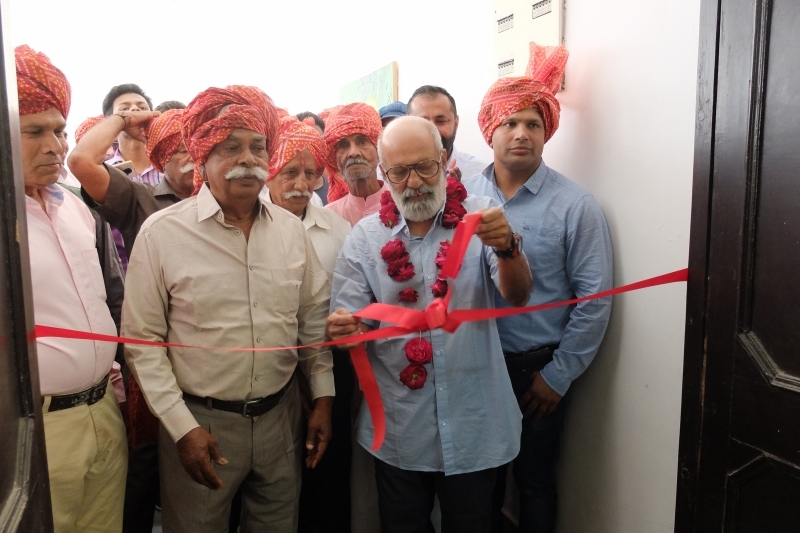 The exhibition was opened by the Hon'ble Vice-Chancellor of Kota University Prof. Madhusudan Sharma. Dr. Nita Jain along with Dr. Kusum Dang, both of whom lecture at Government College, Kota, gave a presentation at 6.30pm on Saturday, 4th October on "The Amazing World of Insects" with special reference to Hadoti. A select but enthusiastic group was present. On Monday, 6th October at 10.00am they also held a special session for schools on this same topic, which was very well attended. Tapeshwar Singh in association with the Forest Department organised an insect spotting trek on Sunday morning on 5th October. In the evening at 6.30pm, Tapeshwar, who is also the President of Mukundra Wildlife and Environment Society, along with other members of the society, gave a short presentation on "The First Kota District Waterfowl Census 2013." Following this presentation, Urva Sharma gave a wonderful talk and slide presentation based on her vast personal experience on using flash photography using automatic cameras to survey animals in the wild. She related some fascinating incidents that she and her colleagues encountered while conducting these surveys. 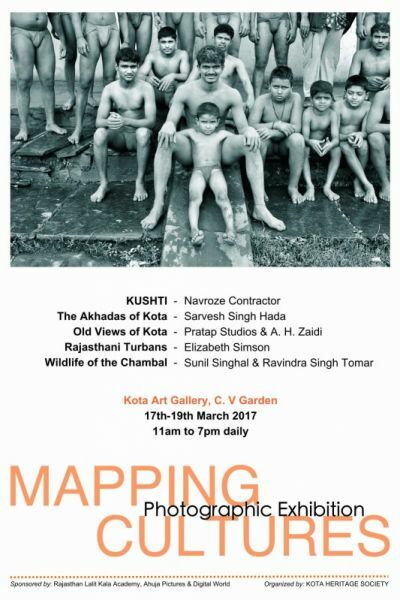 Urva is from Kota and her work takes her to all parts of the country. 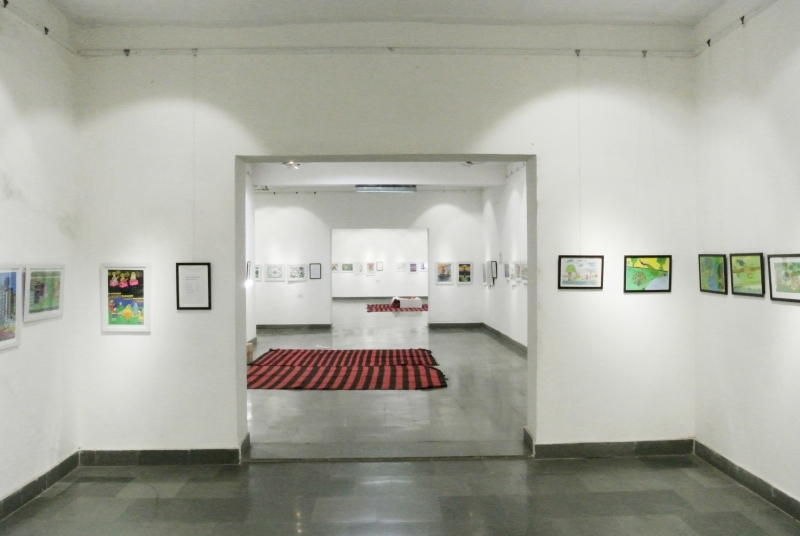 This year's exhibition was sponsored by Digital World and Ahuja Pictures, and art activities by St. Joseph's e-School. We are very lucky to have the patronage of our sponsors. This exhibition is also on facebook !!! 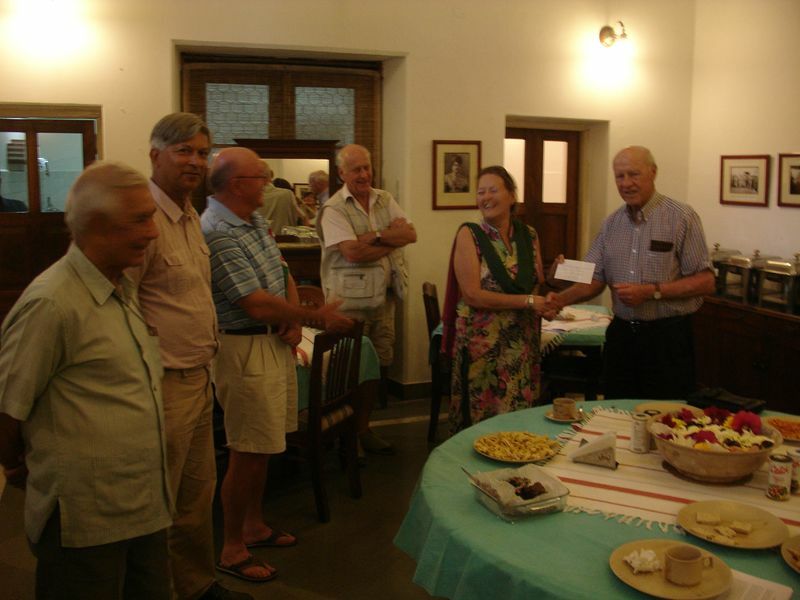 This year we arranged our AGM around the visit of a group of eight South Africans, five of whom were connected to the assistant surgeon Dr. Murray Salder, who was murdered in the Residency compound by the rebels on 15th October, 1857. 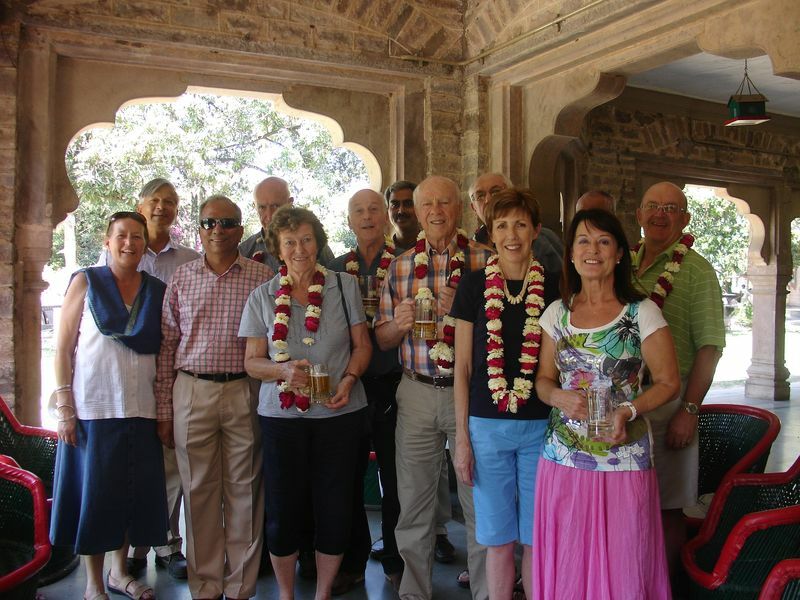 The Titch Tours group hosted a lunch at Sukhdham Kothi on Friday 21st March for some KHS members. 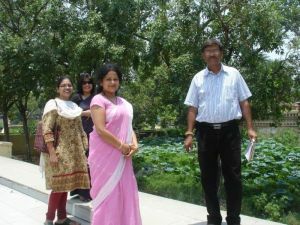 And then we showed them around Kota which included a visit to the British Cemetery, the likely last resting place of Dr. Salder. On Saturday the 22nd , we arranged a tour of Kota's fortifications by cycle rickshaw, and then we had our AGM while the Group explored Bundi. The Group joined us for tea afterwards, and here Pat Patterson is presenting $530 to the society. For more photographs, go to the "British Cemetery Kota" link. A national survey of de-notified tribes is being carried out under the auspices of KHS for the state of Rajasthan. The funds for this survey are being channelled and disbursed through us to ensure proper accounting of all expenditure. 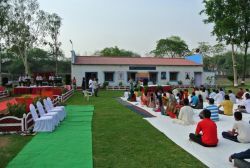 Sixteen people, mainly from the nomadic and semi-nomadic communities that they are surveying, came together in September 2013 at Sukhdham Kothi for a training weekend. The government would like to know their educational status, experience of schooling or lack of it and their aspirations. 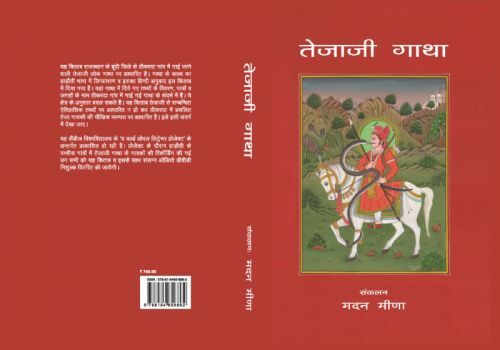 The nomadic communities being surveyed in Rajasthan are: Bhat, Gadia Lohar, Multani, Kalbelia and Raika (Rabari). The other tribes specified were Baori, Kanjar, Mogia, Nut and Saansi. We added Bagaria which is a very poor broom making tribe. Between 125 and 250 families from each community are being covered depending on its size. A de-notified tribe is one which was notified as "criminal" by the British and then de-notified at Independence, but they are still referred to as "denotified" which perpetuates the stigma. To celebrate Wildlife Week we invited local amateur photographers, including school children, to submit two photographs each on the theme "Birds of the Chambal." We had photographs from over thirty different people and these were framed thanks to sponsorship from Ahuja Pictures, and displayed from 2nd of October to the 4th of October at the Kota Art Gallery. There were wildlife films each evening and workshops and interactive events during the day. 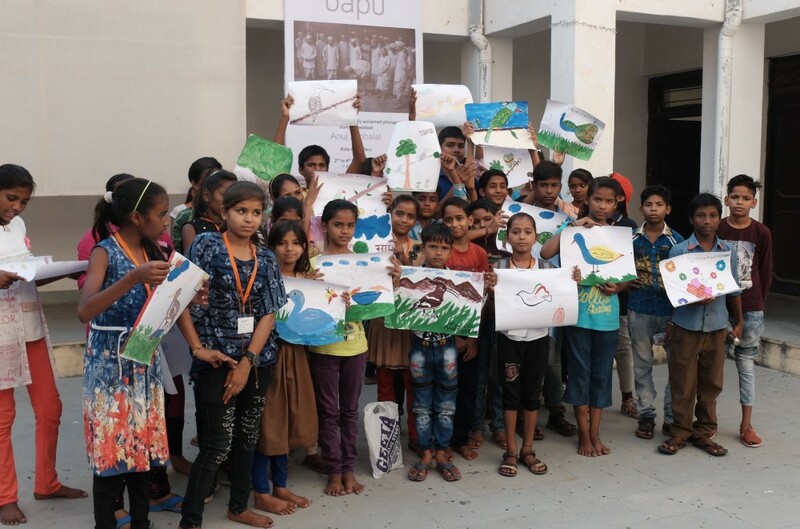 We wanted to encourage Kota residents to appreciate the varied and colourful birds in the area and to be more aware of the effects of litter and pollution in waterbodies on local birdlife. At our 2013 Annual Monsoon Meeting we screened the film "Tears of Dancing Letters," a documentary about calligraphy. This gentle and thought provoking film was made by Kota film enthusiast Sarvesh Singh Hada, who was there to discuss the film and answer questions. It was in Hindi and English with English subtitles. 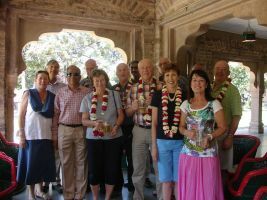 This was an enjoyable occasion and was followed by tea thanks to Sukhdham and those who contributed food. 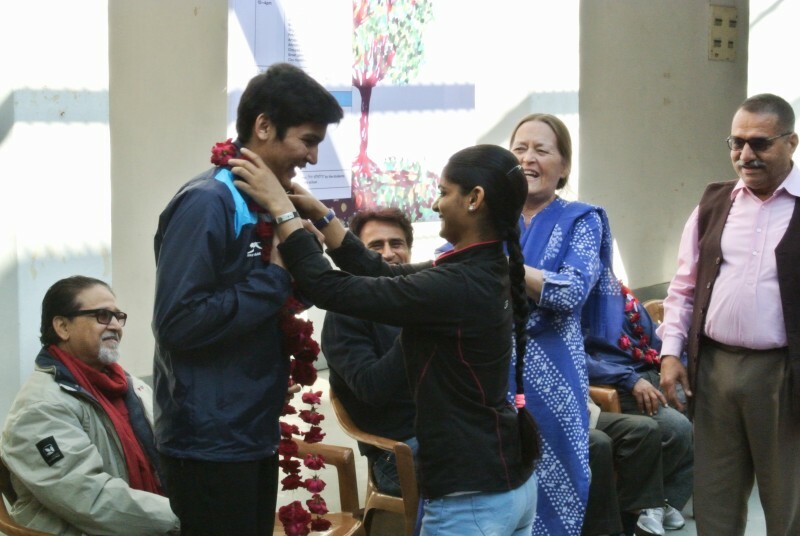 We were able to welcome Madan's wife, Rekha, who is next to him in this photograph. 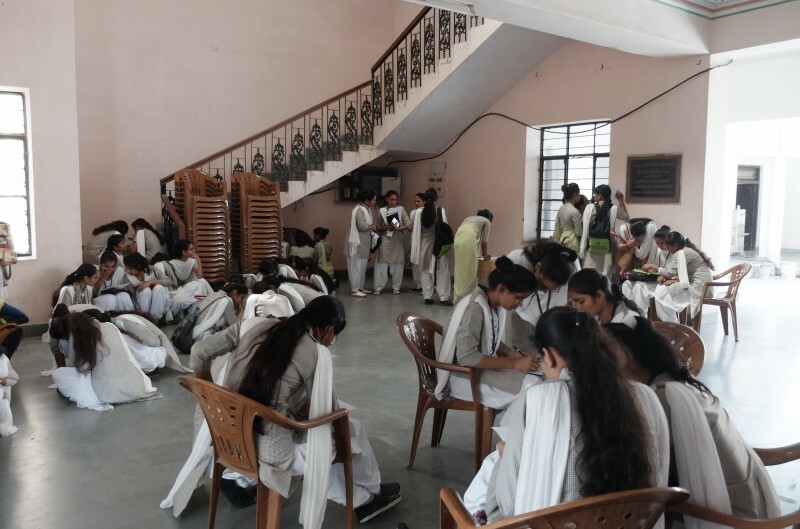 A second eye camp was held on Sunday 24th March at Sister Aurora's St. Clare Seva Sadan in Kaithoon. 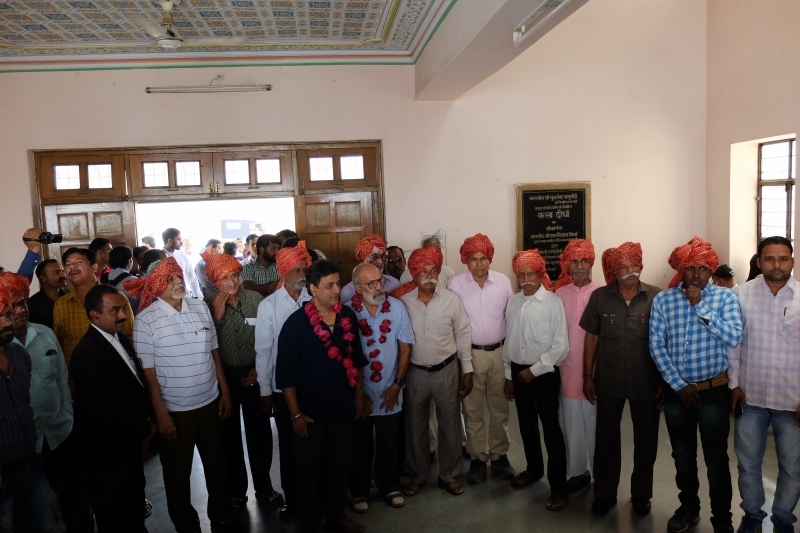 This time the glasses were subsidised rather than completely free and 100 weavers received spectacles. 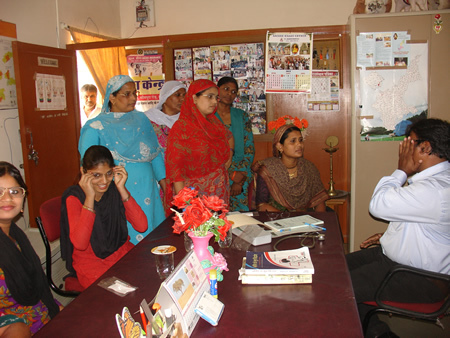 In this picture some of the women are listening to Dr. Raj Kumar of Emmanuel Mission advising them on eye care. 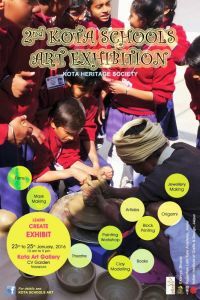 Kota Heritage Society was recently associated with the Tana Bana project. 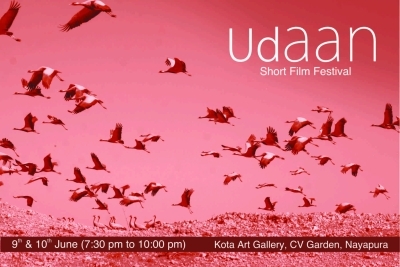 Kota Heritage Society was very happy to be associated with Kota's first short film festival which was held at the Kota Arts Centre on 9th and 10th June. 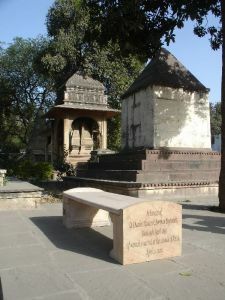 Tejaji Gatha, the ballad of Tejaji, was launched at the Thikarda shrine near Bundi on Wednesday 15th February 2012. The book launch was a very memorable and colourful event. The musicians sang for two-to-three hours and the bhopa attained a state of trance. 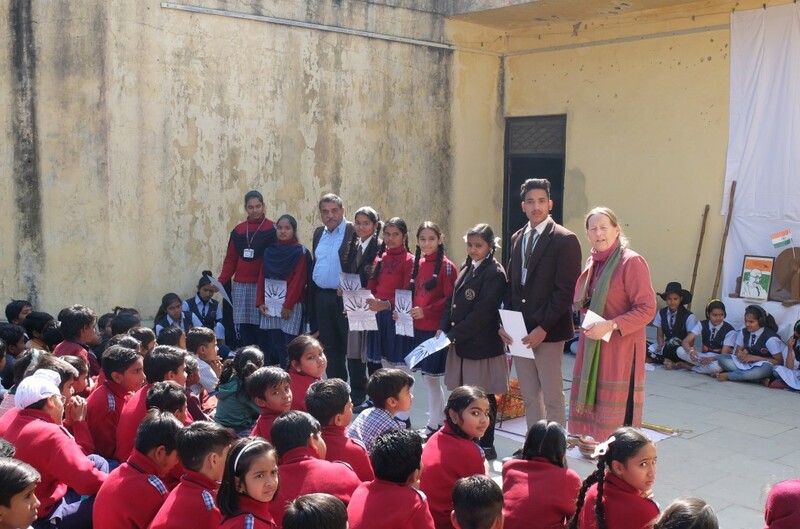 Maharaja Rajendra Singh Dugari received the first copy of the book, and KHS member Frances Yeowart received the next two on behalf of Cambridge University. Over forty copies were presented to the musicians and other local people who helped with the book and the recordings. 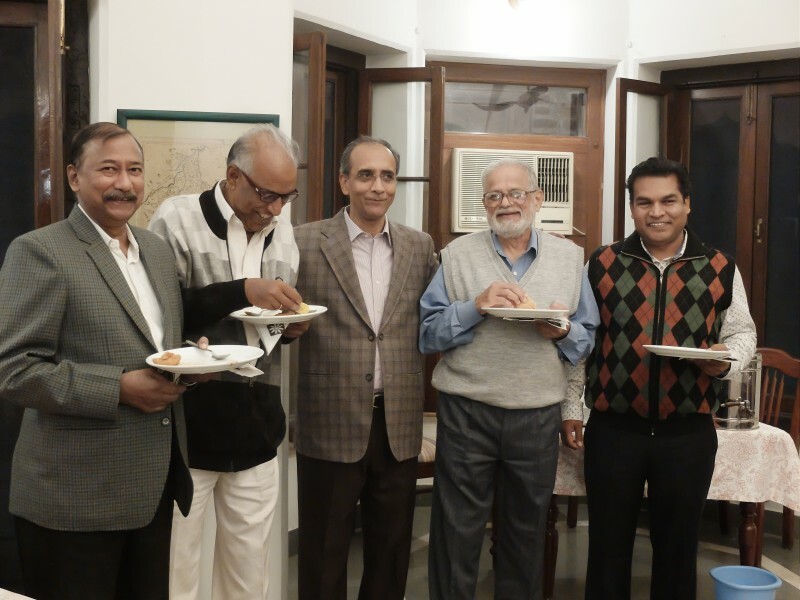 The presentation was followed by a dal bati churma feast provided by Madan Meena for the musicians and guests. Each book contains the transcription of the entire ballad in Hadoti and a 19-hour audio DVD. By a happy coincidence, four British members of KHS were there. 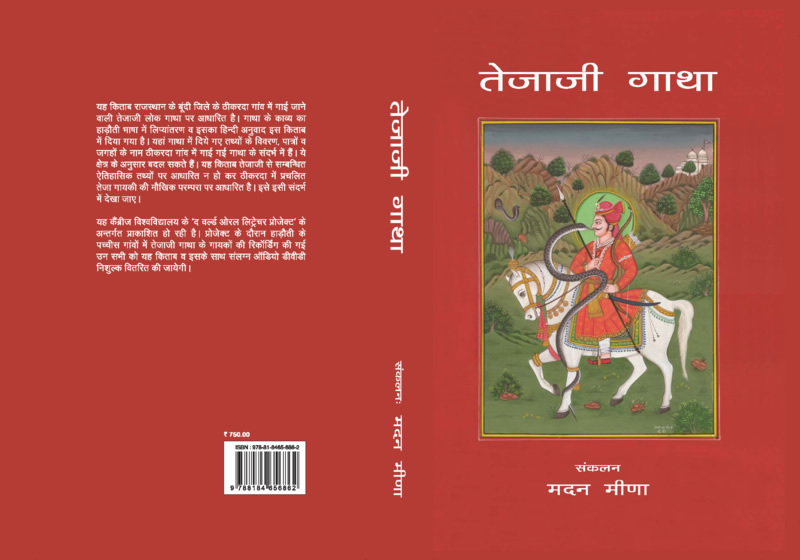 Copies of the book are available for Rs.750, or Rs.500 to members. Part of the sale proceeds will go to KHS to finance Madan's recordings of other versions of the Tejaji Gatha. The Hancock commemorative bench was finally delivered, inscribed and placed in position at the British Cemetery. 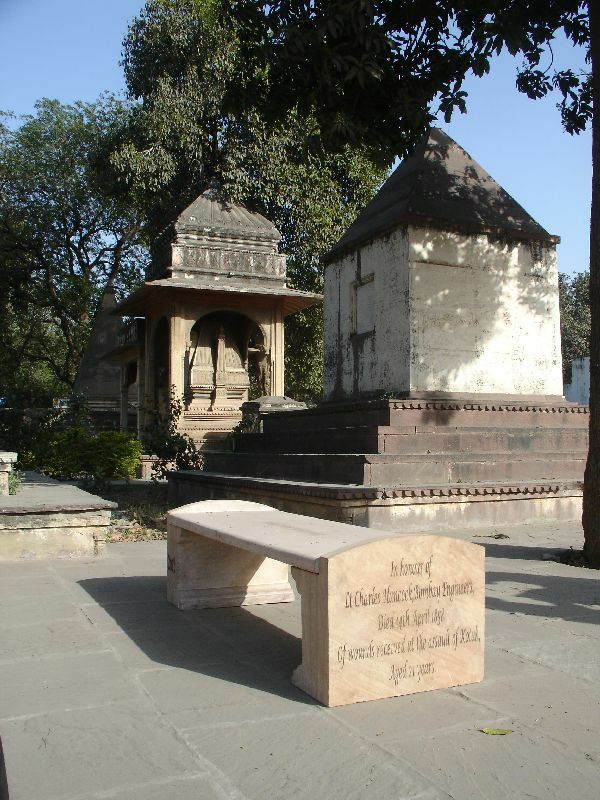 It commemorates Lt. Charles Hancock who died on 14th April, 1858 of wounds received during the retaking of Kotah. It also commemorates all those who lost their lives in the 1857-58 Kotah Uprisings. BACSA gave a grant of 200 GBP which was used for painting the area around the gate and for some planting work. But the six bottle palms planted have died mysteriously during the monsoon and we must think again. We were privileged to premiere "Jharu Katha" a film by Navroze Contractor, the renowned documentary maker at Sukhdham Kothi in August 2011. 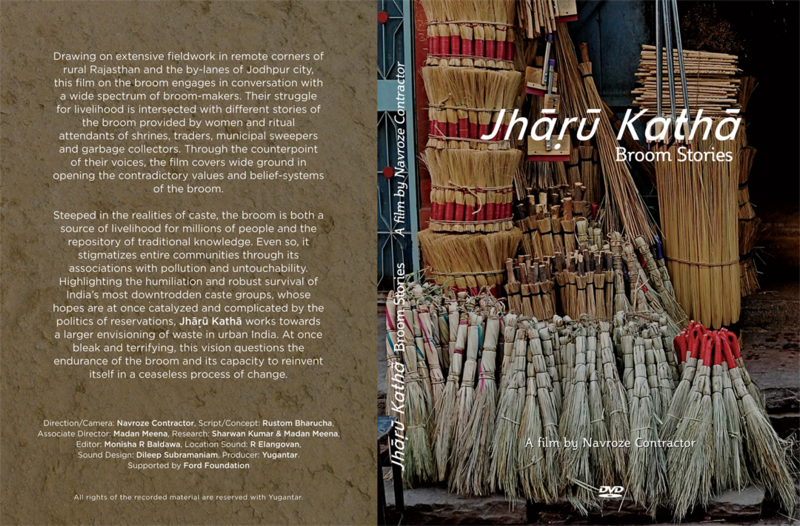 "Jharu Katha" or "Broom Stories" gives a fascinating insight into the lives of broom makers. This film is now available on DVD and can be purchased through KHS using our contact form on this website. Madan Meena is the Assistant Director of the film. Visitors are presented with interesting information about the Society, but will be able to access all the features on being accepted as a member. Members please login to access additional information.